Veterans Advocate Says He Fears Loss Of Faith In VA : The Two-Way Veteran Tom Tarantino says allegations of delayed health care for veterans should be taken more seriously. But he says the care can be great, "once you actually get in" the system. 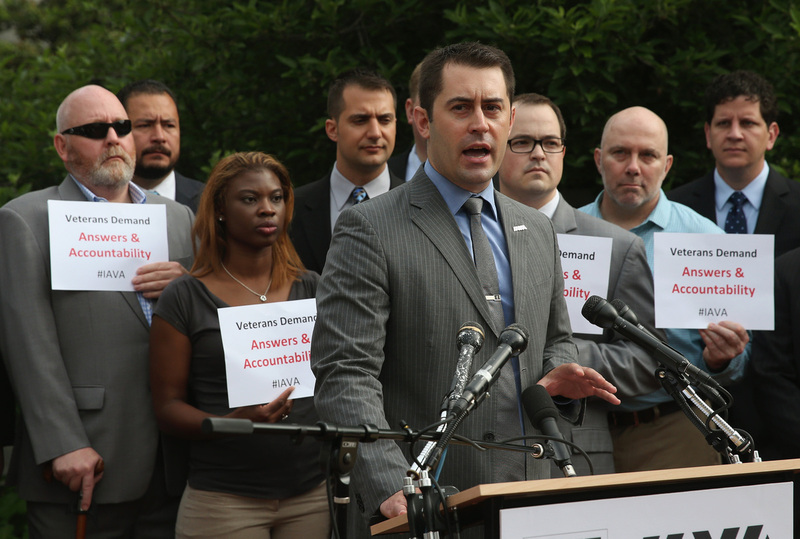 Tom Tarantino, chief policy officer at Iraq and Afghanistan Veterans of America, speaks at a news conference on Capitol Hill Thursday about holding the Department of Veterans Affairs accountable. Advocate and former Army Capt. Tom Tarantino says he's worried that allegations over delayed health care will keep veterans away from services. "Our biggest fear is that there are veterans out there who are not going to seek help because they lose faith and they lose trust in the VA," he tells Tess Vigeland, guest host of All Things Considered. Accusations of long waits at a Phoenix Veterans Affairs hospital, which may have resulted in deaths, surfaced in April. Tarantino, chief policy officer for the Iraq and Afghanistan Veterans of America, says complaints of delays aren't new. Anecdotes of long waits go back years, he says. Tarantino says VA Secretary Eric Shinseki may be "mad as hell," but his concern didn't come across when he spoke to a Senate panel on Thursday. "He looked unprepared, he did not emote the type of confidence that we need to see from someone who is — for lack of a better term — the chief veteran of the United States," Tarantino says. A day after the testimony, Undersecretary for Health Robert Petzel resigned (though his retirement had already been announced in September). Should Shinseki follow suit, as some have called for? "If these allegations are true, and veterans lost their life waiting for care, the next question shouldn't be: Should the secretary lose his job? It should be: Has there been criminal negligence?" Tarantino says. Moreover, he wonders whether losing Shinseki would help — or perhaps even worsen — the situation. Sen. John McCain, in the weekly Republican address on Saturday, said piecemeal responses from the VA would not be adequate, as The Associated Press reports. "What's needed is a total refocusing of the VA on its core mission of serving veterans — stretching from its top political leadership all the way through to its career civil servants," he said. "I think my experience is reflective of what a lot of members are experiencing, that getting to the VA is a hassle, dealing with the VA is a hassle, but once you actually get in, their care is quite good. "So there's a lot of good stuff at the VA, we just have to make sure that the bad is taken care of, it's taken care of swiftly and efficiently, and nobody is in danger because of it." Part of handling mismanagement is getting whistle-blowers to report it, which isn't easy in cases where personal experience might contradict official reports. Iraq and Afghanistan Veterans of America hosts a website that allows veterans and VA employees to anonymously report fraud.